Last week was Tom’s birthday and I was so darn busy that I did not make a darn thing for him. Not even his morning smoothie or his cup of coffee. Isn’t that just terrible? I did do the dishes, stomach something that’s usually his responsibility and one of the chores I hate the most. Yet despite my chore penance, I still felt the need to make it up to him with a big, ridiculous meal. Because food is love right? So this weekend I made him fettuccine from scratch. If homemade pasta does not say I love you, then I don’t know what does. I also brought out a very fancy olive oil from Pacific Sun that I had been saving for a special occasion. I love this olive oil. It’s fruity and buttery and everything a really good olive oil should be. Perfect for dipping bread, dressing salad or drizzling on pasta. Also perfect as the basis of an arugula and olive pesto that was the right balance of herbaceous, briny, garlicky, cheesy and luscious. I finished the pasta with some butter-sauteed local rock shrimp and we dug in. There’s nothing more satisfying than making a really good dish to celebrate someone you love. In my eyes, a glass of wine and a bowl of pasta is so much better than any cake. It made a very happy birthday dinner. Simply omit the shrimp for a vegetarian dish. In a blender or food processor, combine all of the pesto ingredients and pulse until blended and almost totally smooth. Set aside. Set a large pot of water to boil. Once it comes to a rolling boil, salt the water generously and cook the pasta until almost al dente, then drain and toss with the pesto. While your pasta water is coming to a boil, set a large skillet over medium heat. Once it’s hot, melt the butter and saute the shrimp for 5 minutes, or until they turn opaque (time really depends on the size of your shrimp). Remove from heat and place on top of the pesto-dressed pasta. Will be making it on the weekend! 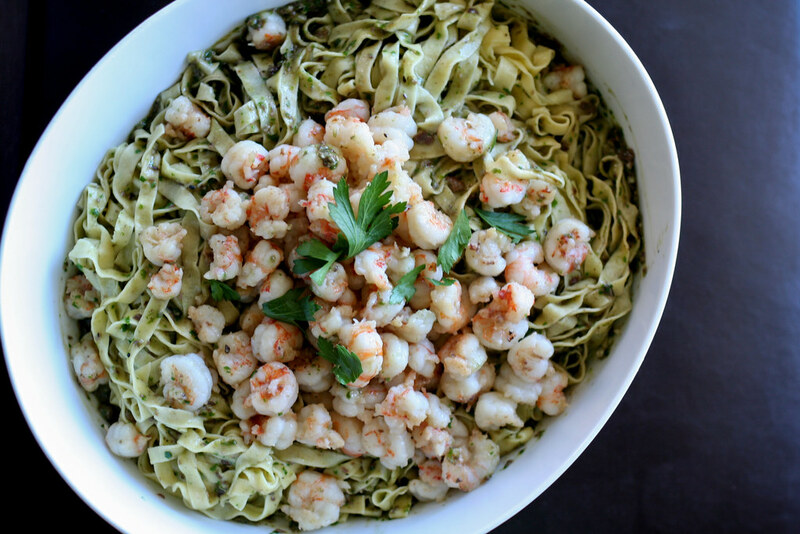 I can’t eat shrimp anymore but the pesto sounds so good I will make this anyway- sans shrimp! This looks beautiful and you can’t go wrong with rock shrimp. Love it! I can imagine how delicious this must have been. Thanks for the olive oil shout – always good to know of a tasty product. And I agree – this would be WAY better than a birthday cake! 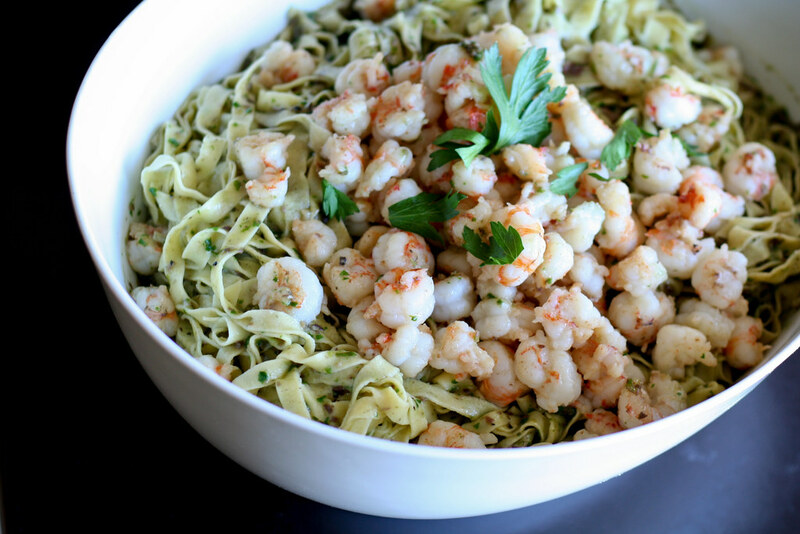 I love shrimp pasta dishes…they just seem so much lighter. The pesto sounds great too…love the addition of olives. Can I just point out that this comes up under vegetarian when prawns are most definitely non-vegetarian. Sorry, just bugged me a bit. Rachel – Sorry about that. I just figured that the pasta dish itself is vegetarian and delightful on its own. The shrimp are definitely optional. Cannellini beans would be a nice substitute.